German biathlete Kati Wilhelm (sporting some delightful red hair, I might add) is the last (finally!) in my list of retiring athletes to cover. That Wikipedia link tells me that she was actually dubbed “Little Red Riding Hood” by the German press due to both her hair and a red hat she wore for all races. Wilhelm is an exceptionally accomplished biathlete: I found 69 podium finishes in major events (World Cup, Olympics or World Championships), which included 4 individual Olympic medals and 5 more from World Championships. And of course that’s on top of numerous medal winning German relay teams. 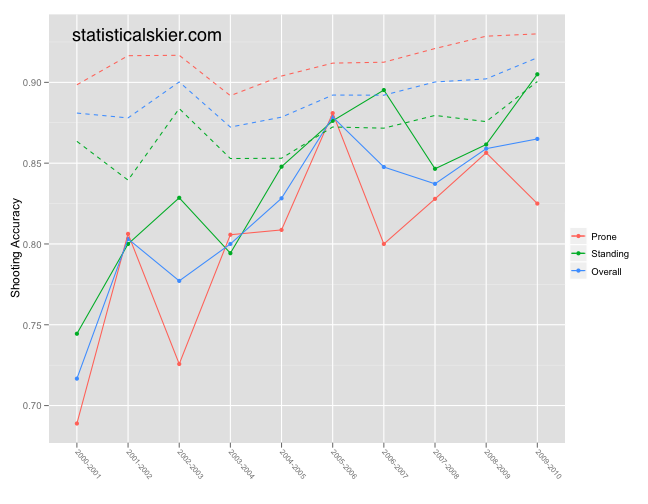 Another classic looking skiing career here: several years of steady improvement, a peak, and then a few years of decline right before retirement. 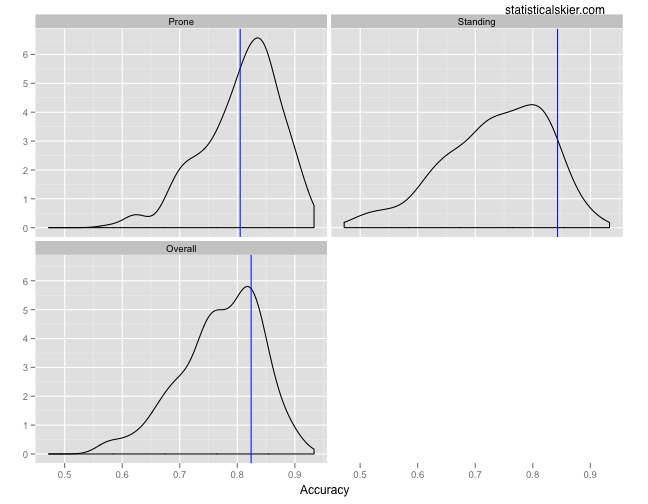 Two things stand out to me in these data. First, 2003-2004 stands out as kind of an off year. 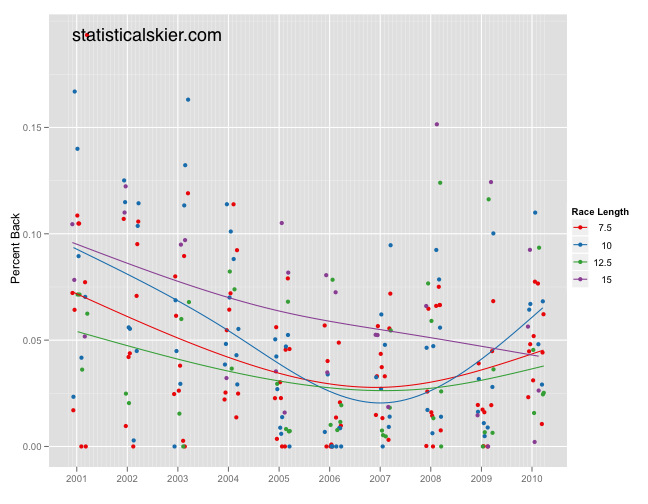 Second, look at that string of lots of very fast races between 2005-2006 and 2008-2009! Wilhelm appears to have been extremely consistently near the top at big races. I guess I’d say that the only salient feature here is that Wilhelm might not have preferred the 15km distance event. As far as shooting is concerned, I have Wilhelm shooting 82.4% overall, 80.5% prone and 84.3% standing over her entire career. Interestingly, she seems to have shot considerably better standing than prone. How did this stack up against her peers? Recall that the dashed lines represent the shooting performance of top ten finishers for each season. 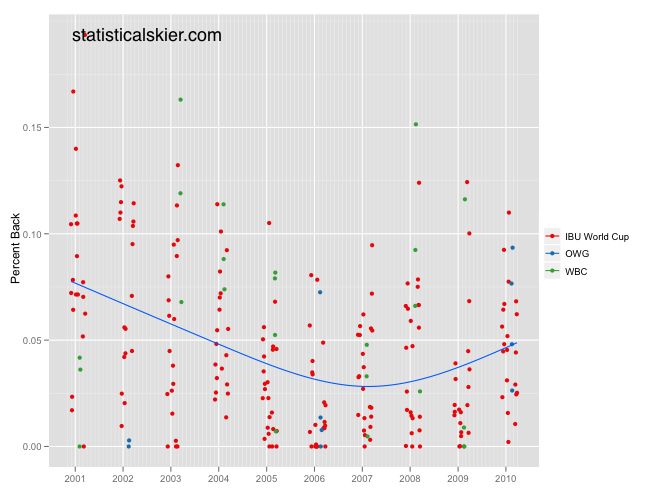 Notice that the green line (standing) is nearly always above the red line (prone), which isn’t typical. Posted by Joran on Friday, September 24, 2010, at 7:00 am. Filed under Uncategorized. Tagged biathlon, kati wilhelm, retirement, retrospective. Follow any responses to this post with its comments RSS feed. You can post a comment or trackback from your blog.